After spending some time on Girl Charlee’s Knit Fix Facebook page, I saw someone who mixed two unexpected fabrics to make a fun shirt… so I decided to recreate that with the fabrics from my own bag. 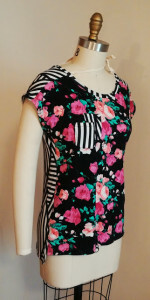 For my next project, I used the pink mint floral on black and more of the black crossed lines (from yesterday’s Mesa) to make iCandy’s Summer Tee. The Summer Tee is a FREE pattern (although it only fits as a “medium”, it could be easily sized up or down) with a dropped shoulder seam and side slits at the hem. To bring a bit more interest to the front, I added two micro pockets in the crossed lines – initially I liked this look, but giving it fresh eyes the next day, I’m not sure how I feel about them. Overall, the fit is pretty good, it’s easy to sew (although, the directions are sparse and are more like ‘tips on sewing’ than anything else), and the style is definitely different than anything else that I own. In my book this is a good free pattern to try out for summer! This entry was posted in Knit Fix on June 30, 2015 by stacy.